Adaptation to a changing climate is now unavoidable. There is widespread agreement that the best way to organize climate change adaptation is to integrate or ‘mainstream’ adaptation objectives into existing policies for transport, agriculture and urban planning. This means that policy-makers and stakeholders jointly take responsibility to ‘climate proof’ these sectors. But does that work in practice? Our work in this area shows that, although in most cases sectoral policies contain explicit adaptation objectives, only in a minority of cases does this translate into concrete measures. In this lecture the problem will be investigated in more detail and some suggestions will be made to overcome the implementation deficit in climate change adaptation. Professor Hens Runhaar is an Associate Professor of Greening of Public Policy at the Copernicus Institute of Sustainable Development at Utrecht University and an Extraordinary Professor of Governance of Agrobiodiversity at Wageningen University and Research. 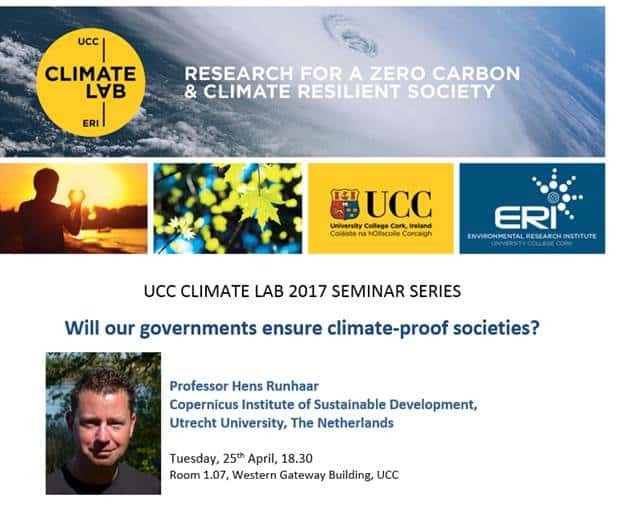 This is a free event open to the public organized by UCC Climate Lab at the Environmental Research Institute, UCC. All are welcome. Please register at link below. Registration is required – please register here. On November 30th World leaders meet in Paris to finalise a new global deal on climate change. People all over the world are taking to the streets to show that the time for procrastination is over and it is now time to act. Cork is joining in this global day of Climate Action and the rally in Cork will convene at the Grand Parade at 2.00 p.m on Sunday 29th November 2015. The March will set off promptly at 2.30pm with the route taking in Oliver Plunkett Street, Parnell Place, Merchants Quay, Patrick Street and ending back at the Grand Parade. The Cork City Samba Band and other entertainment will join the March to create an atmosphere of positive energy to build momentum in moving in the right direction to tackle climate change. Organisers and supporters of the March in Cork include Cork Environmental Forum, Trocaire, Social Health & Education Project, People’s Climate Ireland, UCC Green Campus, Transition Town Kinsale and UCC Environmental Society. We encourage everyone to join in as this issue impacts all our lives and is contributing to injustice and hunger around the world. Let our governments know we want real commitments and real actions to stop climate chaos and injustice. We invite family and friends of all ages and from all parts of Munster to come along. Groups can bring banners and placards with appropriate messages and we ask people to wear green, if possible, the colour of clean energy! Be a part of the movement against climate change and help to make a difference by showing our leaders and those of other countries that people in Ireland care about climate change and the future of our shared planet. Pope Francis has now published his encyclical dealing with Climate Justice and the Earth. It is intended to be a major wake-up call to Christians and to people of other religions or no religion. But will it make any real difference to our world? Will it help to galvanize us as individuals, and the politicians we elect, to take effective action to meet the huge ecological problems which threaten our whole way of life, and which are already severely affecting the poorest people in poor countries? The impact of the encyclical will depend on how well we get to know it and how we respond to its call. The seminar will offer an opportunity to reflect on the encyclical’s significance and message. It will be conducted by Donal Dorr DD, author of many books on aspects of justice and spirituality, in particular Option for the Poor and for the Earth: Catholic Social Teaching. In the first part there will be a talk outlining the ecological spirituality presented in the encyclical, reflecting on its strong points and noting aspects which could be developed further. There will be a chance for some discussion in the group after this talk, including some sharing of participants’ own experiences of ways in which the gifts of nature nourish the spirit. A second talk will focus on the ecological problems which the encyclical mentions. During the discussion in the group after this talk there can also be some sharing of participants’ own knowledge and experience of these and other environmental problems. The third talk will look at the practical actions which the encyclical proposes as ways to enrich our own ecological spirituality and to respond to the problems. During the discussion in the group after this talk there can again be some sharing of participants’ own experiences and suggestions for finding energy and commitment to develop a sustainable way of living. The Environmental Research Institute, University College Cork in association with UCC’s Energy Policy and Modelling Group, will host a lecture by Dr Christoph McGlade on the topic of “Unburnable Carbon: Which fuels must remain unburned to limit global warming” on May 6th in the Western Gateway Building (6-7.30 PM). A third of oil reserves, half of gas reserves and over 80% of current coal reserves globally should remain in the ground and not be used before 2050 if global warming is to stay below the 2°C target agreed by policy makers, according to recent research by the UCL Institute for Sustainable Resources. The study identified the geographic location of existing reserves that should remain unused and so sets out the regions that stand to lose most from achieving the 2°C goal. Lead author Dr Christophe McGlade, Research Associate at the UCL Institute for Sustainable Resources will present findings of the study. The study has direct relevance for global fossil fuel markets and important implications for countries like Ireland with a high reliance on imported fossil fuels. The authors show that the overwhelming majority of the huge coal reserves in China, Russia and the United States should remain unused along with over 260 thousand million barrels oil reserves in the Middle East, equivalent to all of the oil reserves held by Saudi Arabia. The Middle East should also leave over 60% of its gas reserves in the ground. The development of resources in the Arctic and any increase in unconventional oil – oil of a poor quality which is hard to extract – are also found to be inconsistent with efforts to limit climate change. An introduction to the event and relevance for Ireland will be given by the chairman for the evening Dr Fergal McNamara who is senior energy advisor at DCENR. Dr Brian Ó Gallachóir of UCC’s Energy Policy and Modelling Group will also give a short talk on research in UCC investigating options for reducing Ireland dependency on imported fossils fuels and reducing carbon emissions. This will start at 18:00 sharp. Join Cork Environmental Forum, CIT Blackrock Castle Observatory, Cork Astronomy Club & Tyndall National Institute to celebrate the global Earth Hour event & The International Year of Light 2015. Event kindly supported by Cork County Council. Explore alternative light sources (for lights out hour 8.30pm -9.30pm) & see the lights of Cork city from this amazing vantage point. Earth Hour is a global environmental movement by WWF. WWF is the parent organisation of Earth Hour and started Earth Hour with teams and partners in Sydney, Australia back in 2007. Earth Hour™ Global is a registered Charity under the Charities Act in Singapore and company limited by guarantee. Even though this is an opensource campaign, the Earth Hour brand is legally trademarked worldwide and licensed for use by WWF delivering the Earth Hour movement. 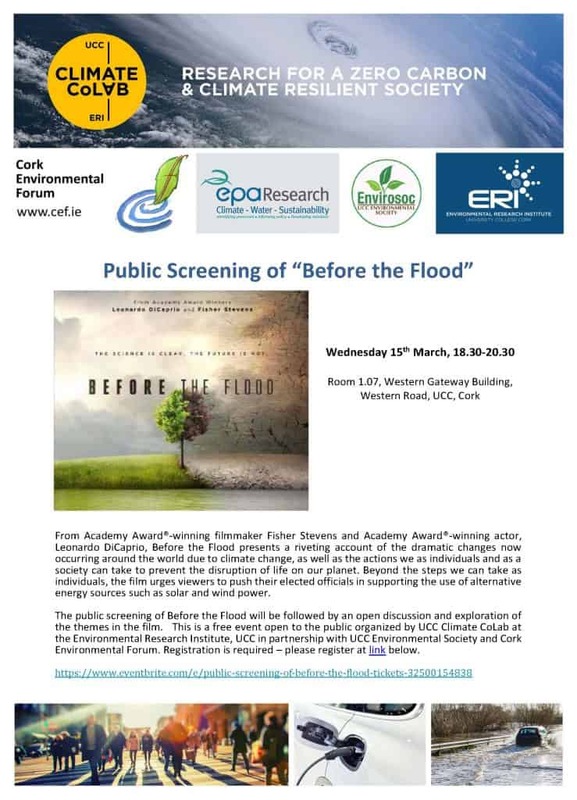 The Environmental Research Institute, UCC is pleased to announce that it will host a webcasting of the Environmental Protection Agency Climate Lecture Series this Autumn. The webcasting will be twinned with an introductory lecture by a UCC expert who will provide an Irish perspective on the lecture theme. The EPA Climate Lecture Series continues the popular series of climate change lectures which aims to provide scientific insights on climate change and to outline options to respond to this challenge. On Monday 6th October, 2014, Professor Ottmar Edenhofer, Co-Chair, Intergovernmental Panel on Climate Change (IPCC) Working Group III, will present a lecture on solutions to the challenges of climate change. Professor Edenhofer is Co- Chair IPCC Working Group III, Mitigation of Climate Change and is Deputy Director and Chief Economist at the Potsdam Institute for Climate Impact Research (PIK). Before the webcast Dr Brian Ó Gallachoir, UCC will present a lecture on “How can Ireland move to a low carbon future?” Dr Ó Gallachóir is Principal Investigator of the Energy Policy and Modelling Group at the ERI and is Director of the MEngSc in Sustainable Energy in the School of Engineering, UCC. Places are filling quickly for the Professional Certificate in Strategic Climate Change Adaptation. The programme is taking place in London from 24th – 27th November 2014. If you wish to attend please register online as soon as possible. This programme will equip participants with successful techniques to integrate environmental and sustainability concerns into strategic planning, develop efficient environmental regulatory regimes, and effectively respond to disasters. The certificate is accredited by the Chartered Management Institute, the leading body that awards internationally recognised management and leadership qualifications. For further information please visit the ICPS website. Energy demand is increasing globally, causing greenhouse gas (GHG) emissions from the energy sector also to increase. The trend is set to continue, driven primarily by economic growth and the rising population. Climate change presents increasing challenges for energy production and transmission. A progressive temperature increase, an increasing number and severity of extreme weather events and changing precipitation patterns will affect energy production and delivery. The supply of fossil fuels, and thermal and hydropower generation and transmission, will also be affected. However, adaptation options exist. Significant cuts in GHG emissions from energy can be achieved through a variety of measures.